MANILA, Philippines (AP) — The Philippine president, notorious for having cursed the pope and world leaders like former U.S. President Barack Obama, has sparked new outrage by calling God "stupid" in Asia's largest Catholic country. 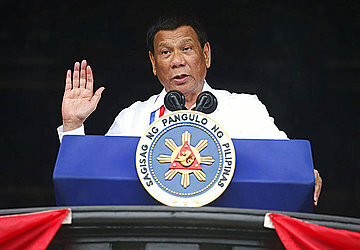 Opposition Sen. Antonio Trillanes IV shot back Monday by describing President Rodrigo Duterte as "one evil man" and his remarks as "very much consistent with the deceitfulness, heartlessness and ruthlessness of his policies." Even some of Duterte's political allies were critical.